We knew the Surface 3 was out, but this? Remember when Microsoft announced the end of the Surface 3 tablet several months ago? Back in late January, the firm reportedly made good on that promise. 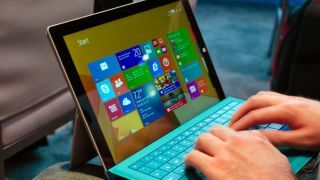 Now, the Surface Pro 3 has gone missing from Microsoft Stores online, TechRadar has found. Searching the firm’s webpages in the US, UK and Australia, the Surface Pro 3 is not available for purchase from the Microsoft Store. Links found via Google in the US and Google in the UK point to still-running webpages for the product, but buy links now redirect to the Microsoft Store’s homepage – as of this writing. Digging a bit further following this discovery, a few lesser-known (and therefore more difficult to trust) news websites reported the Surface Pro 3’s departure back as far as January 30, days after Microsoft’s January 26 earnings call in which it mentioned the Surface Book and Surface Pro 4 replacing the Surface 3 specifically in its lineup. Microsoft hasn’t made any mention of the discontinuation of the Surface Pro 3, having released fresh firmware for this device specifically just at the end of January. Not to mention right about when reports of it going missing from Microsoft’s online stores were published. Being a third-generation Surface device like the Surface 3, it would make sense for Microsoft to discontinue the Pro version alongside this one, though the lack of any specific word on the matter is unexpected. Perhaps Microsoft is making room in its portfolio for a forthcoming Surface Pro 5 and Surface Book 2, both expected to launch later this year. Regardless, without a statement from Microsoft, anything said on the Surface Pro 3’s disappearance is pure speculation. As such, we’ve contacted Microsoft for comment, and will update this article should we receive a response.